Purdue: A general publication regarding cover crops following the summer 2012 drought. Wisconsin: University of Wisconsin fact sheet on considerations for using cover crops in 2012 for nutrient conservation. This resource also recommends a recently published set of cover crop tips for emergency forage. Cover crop selection tools for field crops and vegetables. The Sustainable Agriculture Research and Education handbook on managing cover crops profitably. Links to cover crop education materials from eight different Land Grant Universities. Iowa State: A very understandable explanation of how cover cropping can potentially affect crop insurance coverage. Additional drought resources from over 23 state Cooperative Extension Services are available through the Extension Disaster Education Network. As wildfires erupted, a heat wave settled in, and drought conditions expanded across the United States, Extension Disaster Education Network (EDEN) delegates collaborated to keep the EDEN Fire (Wildfire), Heat Wave—Extreme Heat, and Drought Topic Pages up-to-date with current conditions and collected resources. 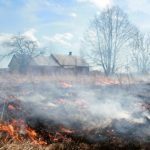 For example, Texas and Colorado resources, along with eXtension resources (in particular, the Wildfire and Water Conservation for Lawn and Landscape Communities of Practice), are highlighted on the Fire (Wildfire) page. In addition to basic information about the types of drought and drought impacts, the Drought Topic Page includes links to USDA Disaster and Drought Assistance, hay hotlines, relevant blogs and Facebook pages, special tools, and twenty-two university drought sites. EDEN activated its Response Notes system, providing a venue for states to update their status and helping USDA/NIFA stay on top of Extension activities. EDEN hosted conference calls focusing on wildfire and drought in June and July, and a conference call in June introducing Next48. This weather dashboard aggregates weather maps and other disaster status maps customized by state. It is designed as a one-stop source for an immediate overview of current weather, forecasts, radar, flood status, drought monitor, flu information, and more. The Fire (Wildfire) and Drought pages also connect to eXtension. Building on the ongoing conversations and responding through eXtension to identified needs, EDEN collaborated with other eXtension CoPs to highlight wildfire resources and to build a public Drought Resources page. The page features resources (with links to Beef Cattle and Water Conservation for Lawn and Landscape CoP content and to external resources) for agricultural producers and homeowners alike. This page and the EDEN Drought Topic Page are works in progress as the drought continues. I don’t know how much Martha and the Vandellas really loved the guy in the 1963 hit song, Heat Wave, but I am almost certain they would not love these temps that we are seeing so far this summer. 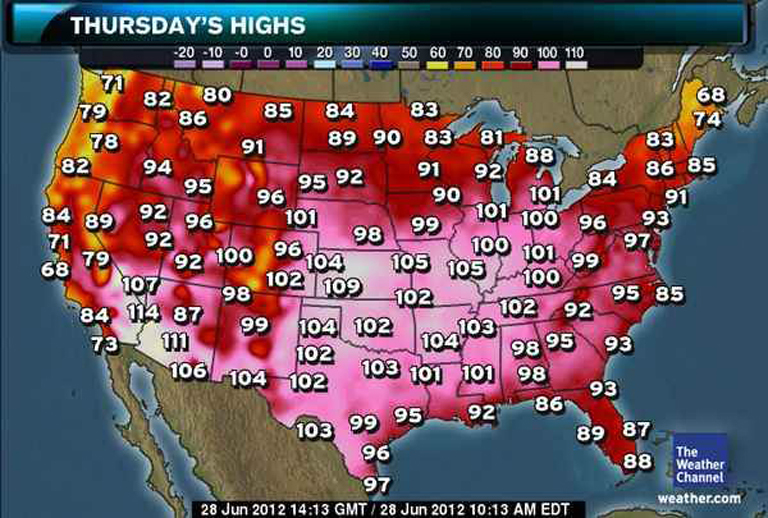 So far, Summer 2012 has brought extreme and record breaking temps across the US. Take a look at this map from yesterday! Can you believe those temps? And all before July 1. Graphic courtesy of The Weather Channel website. Did you know that on average there are more heat related deaths than deaths related to any other natural disaster per year. In 2011, 206 individuals died as a result of extreme heat. So what are you doing to prepare your family for the heat? – Listen to local forecasts. Being aware is being prepared. – Discuss heat safety with your family. Make a plan for possible power outages. – Revamp your emergency preparedness kit.Make sure your kit is fully stocked. – Know those in your neighborhood that are more likely to be victims of extreme heat; like elderly, young, sick, or those without air conditioning. – Verify that your pets’ needs for shelter and water are met. – Listen to your NOAA Weather Radio for updates. – Never leave children or pets in vehicles. – Avoid extreme temperature changes. – Wear loose-fitting, light-colored clothing. – Stay indoors and avoid strenuous activity during the hottest part of the day. – Take frequent breaks if working outside. – Check on family, friends, neighbors, and pets. Stay safe, and have a great holiday next week!